Nowhere in the world are recipes for Jewish Penicillin Chicken Soup more abundant than in Israel and specifically in Jerusalem. The state of Israel was founded in 1948, after World War II. 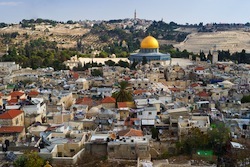 Over the years the Jewish population of Jerusalem has grown to 570,000 people have immigrated to Jerusalem. This recipe for Jewish Grandmother’s Chicken Soup was passed down from one generation to the next and was commonly used to fight cold in pregnancy. Science has proven the healthy effects of chicken soup, but there is no study that can compare to the taste of Jewish Penicillin when you’re feeling under the weather. Throw all ingredients into a large soup pot and cover with water. Water should measure one inch above food line. Heat water on high until it comes to a boil. Lower heat to medium or medium low and simmer slowly. Leave pot with lid slightly off to allow steam to escape. Water may need to be added occasionally. Strain broth from soup and place in refrigerator for one hour or more. Place chicken and vegetables in a bowl to cool. Pull cooled chicken from bones. Remove broth from refrigerator and skim off hardened fat. Add chicken and vegetables back to broth and reheat. Variations: Some women treating cold in pregnancy wish to use chicken breasts in place of whole chicken pieces. If chicken breasts are used in this Jewish Penicillin recipe, the step to remove fat can be eliminated and soup served immediately after cooking is complete. Cooking time will be reduced to 1 hour instead of 1 ½ hours – or until breasts fall apart.